The Pantheon building on Adrianou Street, Plaka. It was situated approximately 50 meters east of the Library of Hadrian and the Roman Agora, constructed over the remains of late Hellenistic and early Roman buildings on the southern side of an ancient street. The building was a large three-aisle basilica, with a large cella, of an estimated length of 85 meters and width of 40 meters, with a porch at its east end. The dimensions of the structure were enormous, surpassing even the Parthenon in size. In this particular plot, part of the northern wall of the building of a total length of 11.50 meters and width of 1.70 meters is unearthed and preserved, in the height of four rows of blocks made of aktite, a local limestone from Piraeus. 7 meters away to the south, a row of internal cruciform piers possibly supported arcades or vaults. 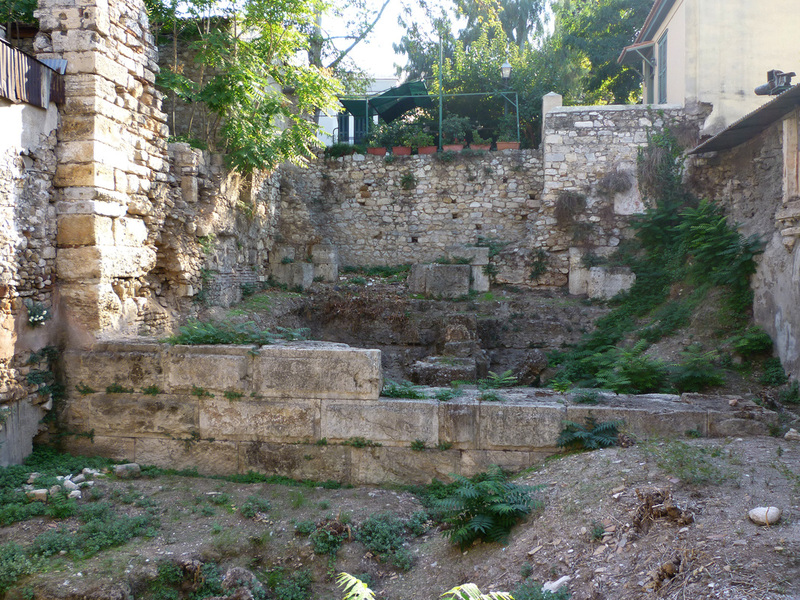 The ruins of the Pantheon building on Adrianou Street, Plaka. ​During the 3rd century A.D. the northern side of the monument became part of the late Roman Fortification Wall. A fortifying tower and an elaborate marble gate were added to that wall during the era of the Byzantine Emperor Justinianus I (527-565 A.D.) and is visible in the neighboring plot. Part of this tower is preserved, 5 meters high in the western wall of the private building on the east. 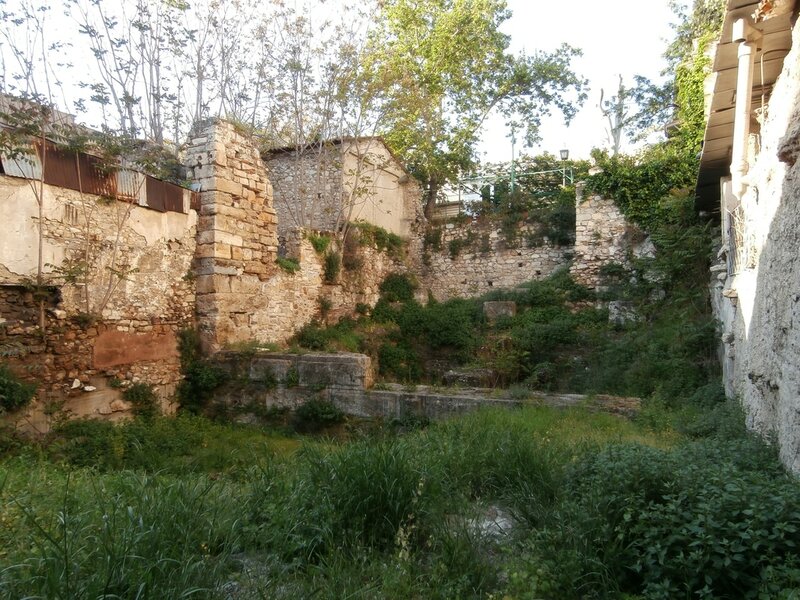 At the southern end of the same property one could see the remains of the post-Byzantine church of Panaghia Krystalliotissa (17th century) that is also preserved in the basement of a last-century building. ​​For a page with Basic Architectural Terminology, including terms used in the description of the ancient Greek temples, click here! In the vicinity of the Pantheon, we recommend Plaka Hotel, a family hotel which is an excellent value for the money. Just a 5-minute walk from Syntagma Sq. and 2 blocks from Monastiraki Metro Station the hotel has a rooftop bar with breathtaking views of the Acropolis and across Athens. ​The 24-hour reception can help you with travel services in Greece and organize day trips around Athens. The elegantly decorated guest rooms at Hotel Plaka include a minibar, safe, free Wi-Fi, and A/C. Most rooms have balcony with views of the Acropolis, Plaka or Lycabetus hill. A rich breakfast buffet and a Greek breakfast are served each morning between 7 am and 11 am. 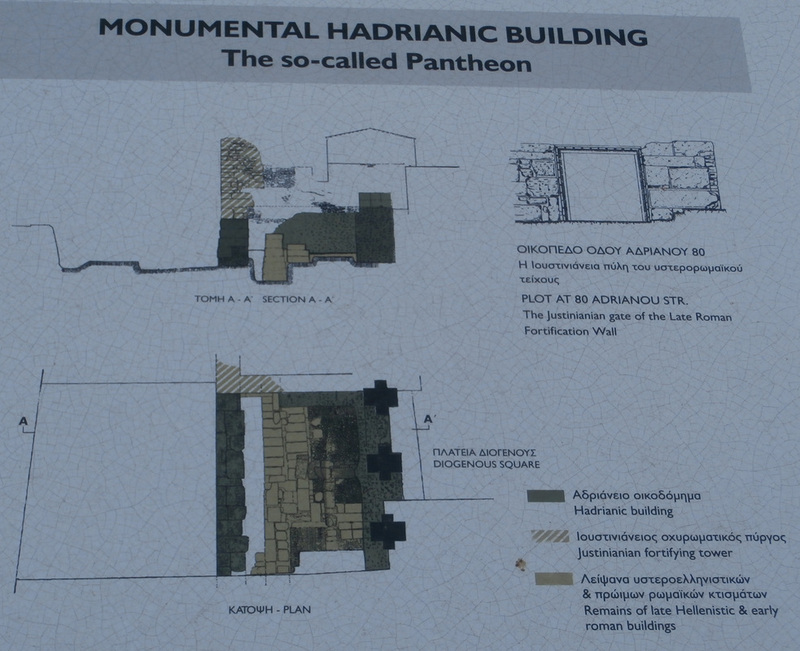 The plan of the excavated part of the Pantheon building on Adrianou Street, Plaka.